Lavender (Lavandula) is a part of the mint family. 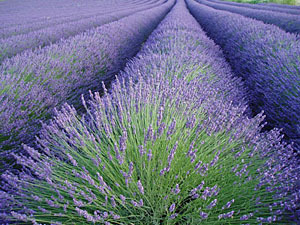 The lavender plant originates from Macaronesia, and was brought across Africa, the Mediterranean, and then into Asia. There are 39 different species of lavender, including hybrids. Lavender grows with best success in areas with dry, well-drained soil and full sun. Humidity can be an issue, as it can lead to rotting of the roots. There is a class of hybrid lavender plants, called the lavandin. They are popular in commercial use, since they are bigger and easier to gather. However, the oil from the lavandin is lower-quality than English lavender oil because it is not as sweet.